Bui Van Tai benefitted from a Samaritan's Purse scholarship to Hoa Sua Vocational School. Le Thi Thu is the Hanoi Project Assistant with Samaritan’s Purse in Vietnam. 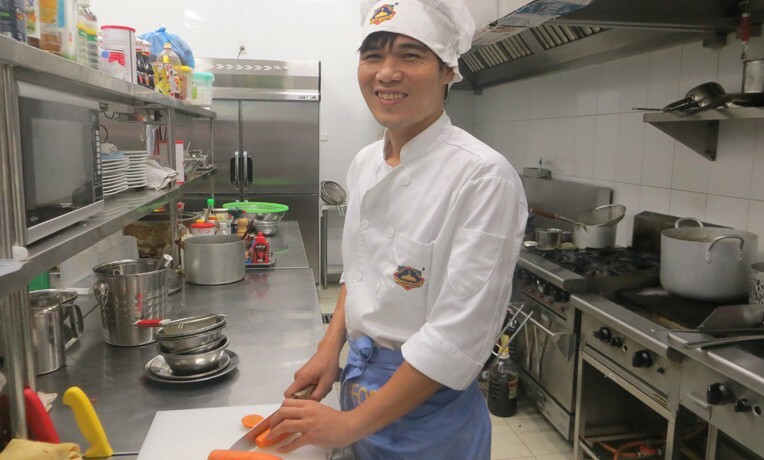 Bui Van Tai is a joyful, young man of 25 who currently works as a chef in a bustling restaurant within the AEON Mall, the biggest trading center in northern Vietnam. His face radiated with joy and happiness when I met with him. However, his life was not always so full of reasons to rejoice. Tai was born to a Muong ethnic minority family in a village called Mai Da, about a two-hour drive southwest of Hanoi, Vietnam’s capital city. When Tai was only 2 years old, his father died from a cerebral hemorrhage, leaving his mother to take care of her two children and blind mother-in-law alone. Their only income came from one crop of sugarcane per year, but sometimes they lost even that to harsh weather. Although Tai loved going to school, he often stayed home to help his mother earn their living. Fortunately, Tai was able to go to Hoa Sua Vocational School with financial support from Samaritan’s Purse. The scholarship he received covered his tuition fees and other expenses. Tai learned everything he could at Hoa Sua and participated actively in the life skills workshops conducted by Samaritan’s Purse. He recalls his time at Hoa Sua School as a precious season of his life. It was the season that gave Tai the crucial knowledge and skills he needed to be where he is today. When I met Tai at the restaurant, he welcomed me with a face glowing with joy. He looked mature and professional in his immaculate, white chef’s uniform. Tai told me that he earns a monthly income equivalent to 300 USD. With this salary, Tai is able to live independently while supporting his family at home. I got to see the significance of the support he gives to his family when I visited his mother. Tai’s mother is a small woman, all skin and bones, but strong. Her paper-thin skin looked weathered from countless days under the sun, but the smile lines around her eyes betrayed her hopeful demeanor. She greeted us and invited us into her small house, which was about 300 square feet, its walls sparsely decorated with a few calendars and a clock. Her eyes brimmed with tears as she shared about her family. She told us how sorry she felt toward Tai because he had to suffer the most because of the family’s circumstances. But now, she rejoices at her son’s success. She also shared joyfully about the financial support Tai provides. Tai overcame many challenges and much pressure to achieve his success.